What’s Your Tax Bracket for 2014? Tax brackets are ranges at which different portions of your income are taxed. The U.S. tax system is set up in a way where each individual pays the same tax on the same income level. The current tax system is a progressive one meaning that the more you earn the more you owe in taxes. The brackets are the cut off amounts and they are different based on how you file your tax returns: single, married filing jointly, married filing separately, or head of household. The effective tax rate for both individuals is different due to differences in income level. It is also different from every bracket rate established. The same methodology can be applied for all income levels and filing status. 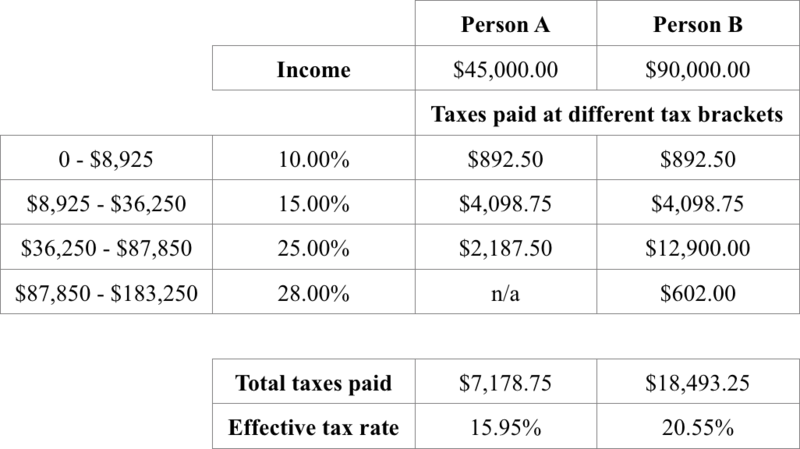 In this hypothetical example, Person B’s effective tax rate is 20.55% vs. 15.95% of Person A. This is because Person B has a greater portion of his/her income taxes at higher tax brackets. Tax brackets change periodically so make sure that are aware of the most recent ones. If you have your taxes made your tax preparer should be aware of those changes; similarly tax preparation software is always up to date with any tweaks to tax brackets. If you decide to amend previous year taxes or file for the first time make sure that you use the appropriate tax brackets. Do not use current tax brackets for income earned in 2012, 2011 or 2010. For information on past tax brackets and rates, click here.